I’ve not posted for a while because it turns out that buying a house on your own and attempting a re-model within the first three months is a MONSTER of a job! I have an 8 1/2′ x 9 1/2′ room with a concrete floor and I can do whatever I want with it (and the three doors and 34″x54″ window). It also turns out that if I say to people, “What do you think about my idea?” I will end up with ideas and ideas and more ideas and then, it turns out, my head goes to mush and I want to move back to my apartment on the second floor where I call the landlord and actually feel warm when I set the thermostat to 70. I kind of figured out what I wanted, and today my friend Theressia came over and helped me build a wall. 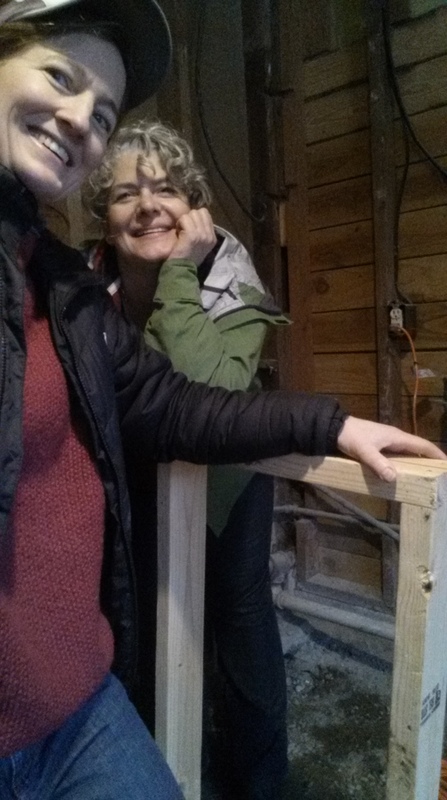 She said it was not rocket science, but I think as the day unfolded and we set out to build our 33 5/8″ x 32 7/8″ pony wall, she realized that for me it was pretty darn close to rocket science. 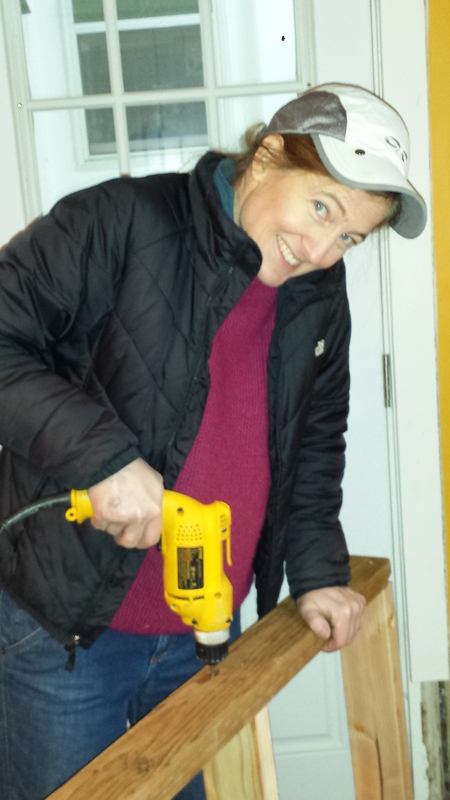 In regard to my wall building skills, I’m a bit more femme than I realized. I had no idea what “squaring” meant. I cannot cut a straight line with a hand saw in a 2×4 to save my life (though with practice, I’m sure I could), I had some trouble “setting” the drill bit in the screw before nearly de-threading it, or whatever you call that, and apparently my hammer is more fitting for a dollhouse than a real tool box. So I used a picture with the drill instead. This was just a 33 5/8″ x 32 7/8″ pony wall, and here’s how we did it. – One treated 2×4 stud (it only came in the 8′ length). – Two regular studs. I learned that Home Depot’s studs are crap. They are all bent and wobbly, like pool sticks that can’t roll flat, they’re going to mess up your game, so go to a lumber yard that has Douglas Fir studs. Not all Ace Hardware stores have them, but one of them in Olympia did. I called the first one and the guy said he had them. I got there and it happened to be him I ran into and he was like, “Ooh… you want lumber!” Apparently there are other “studs”. And he was not the stud I was looking for. – A contractor squarer. That “r” is extra, but if I say “contractor square” you’ll think it’s square and it’s not. It just helps MAKE things square. It squares. It’s a squarer. – Wood screws – 3 1/2 inches long. They’re not really wood, they’re FOR wood. They’re metal, like other screws, just longer and with flat heads. – Saw. There are lots of saws at Home Depot. You want the one that looks like the saw in your head when you read the word “saw”. – Coffee or whiskey, your choice. Step one. Make the measurements for the wall and then make the measurements again. Remember to include, if you are tiling, the grout space between each tile. This isn’t as important for tile as it is for glass blocks because while tile may be cut, glass blocks may not. I’m using some glass blocks, so it mattered. This involves counting multiples of one-eighths, so glasses on because if you’re like us, you might have to see the small print on the ruler and count with your fingers. Add 3/4 and 5/8ths to 31-7/8ths. One. Two…. you get the idea. Step two. Cut the 2×4’s. Well, first measure them. Make a little mark above and below the EXACT place on the tape measure you are going to cut. Then use the contractor squarer to draw a very straight line across the 4″ part of the 2×4. Sawing is tricky. Theressia told me to cut on the right side of the line I drew. Yes, the right side of the 1/2mm line. Otherwise, it might be a tad short, or I’ll cut at an angle. You have to practice and it was clear I was not up to speed. And it’s not for wimps. If you know you’re going to be building a wall, you should start doing push-ups, chin-ups or burpees right away. Or, call a friend. Oh, and make sure you cut the studs, which go vertically, not horizontally, 3 inches shorter than the actual height of your wall because they go in between the top and bottom pieces. And to make things confusing, 2×4’s are not actually 2″ x 4″, they are 1-1/2″ x 3-1/2″. Same with 1×5’s (baseboards), they are actually 1″ x 4″. Don’t ask. I don’t know. It’s weird. Like a conspiracy to make the commoner spend hundreds of dollars on contractors “because your math is all wrong”. Step three. Lay the 2×4’s on the floor, preferably with a straight wall on one side. Then screw the studs… What? Oh come on, you know what I mean… Geez people. We did the two end studs to the top 2×4 first, two screws per stud. Then flip it and do just one screw part way, connecting the studs to the bottom piece (partway, in case you have to try again). Now square it. It’s not really “square”, so don’t think too hard about that. Just as it’s really not rocket science; it’s also not real geometry. To square it, you want to measure exactly the same way, from corner to corner criss cross. They have to be EXACTLY the same if you want a straight wall. It was kind of like my canvas prints – the weather can bend the frames slightly, so you might have to push it one way or another just slightly to make them straight again. Oh – and if you’re using a “real” drill (not my dollhouse drill), then be sure the bit “sets” in the screw – a little clicking noise, or you’ll wreck the bit and in that case, well, you may as well pour another shot of whiskey because your SOL. Step four. The 16″ rule. Studs are 16″ apart. So starting at one end, center the middle stud on 16″. 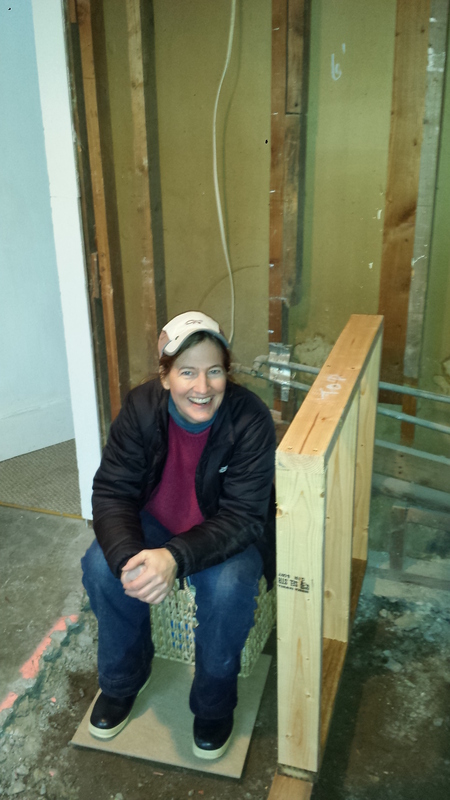 Our wall was 33+” long, so we couldn’t evenly space them, but don’t center the stud at 16 1/2″, still center it at 16″. Reason being, when you go to put up drywall, it’s nice to just count every 16″ to nail it to a stud, until you get to the last one, of course, which may be slightly off. That’s when you use a stud-finder. It’s important to remember from which end of the wall you began measuring the 16″ rule. Otherwise it will be all wrong, and you’ll have to stud-find every one. Step five. Stand it up and take a “selfie” with it. And have your friend take one of you too. This particular wall is a partial shower wall, next to the toilet, thus the make-shift toilet with the basket. In case you were wondering about the basket. And who cares about the basket? We built a pony wall!